This device sits on sliding 15 mm rods that is mounted to a tripod. The unit makes it easy for the talent to read the lines while still keeping eye contact with the camera lens. The type size and speed can be adjusted by the operator. 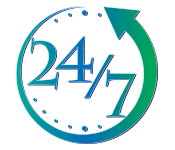 Once you place your order for the teleprompter, you will receive the contact information for the operator so that you’re able to communicate with them. You will need to send a copy of the script via email or give them a copy of it on a flashdrive. All major alterations should be made at rehearsal but if things need to be changed on set, the operators are flexible and resourceful. The Interrotron is divided into two different units: The Director’s Unit allows for evaluation of exposure, focus, framing, color saturation, depth of field, etc. The unit also allows for the director and talent to be “face to face”. The second unit is the Talent Unit which is a professional teleprompter that is built on a platform. This unit is sized to display a human face in the right proportion. The Mark III is the perfect unit for children talent because of its “face to face” connection. 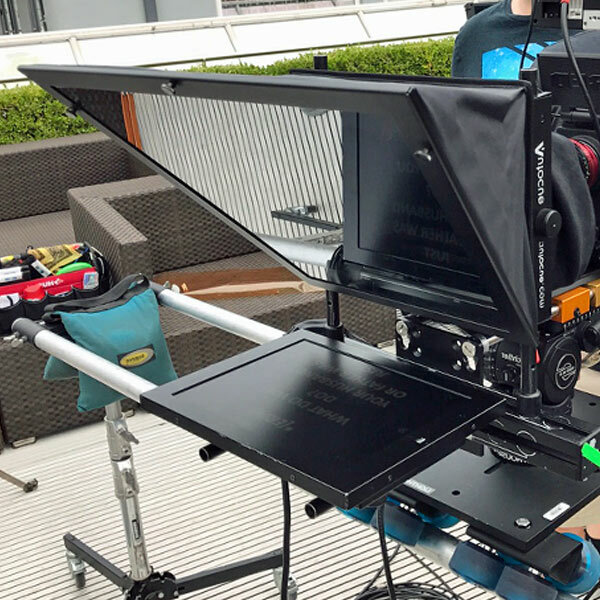 The Mark III also saves time and money because directors are usually able to get it perfect on the first take. The Mark II is able to accept a video signal from a second camera nearby. It also allows the talent to see the director’s face in front of the camera lens, which relaxes the talent. 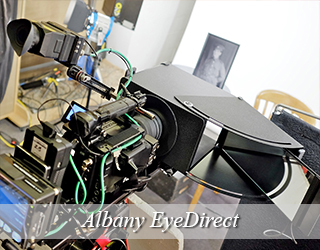 The EyeDirect’s main purpose is to allow “face to face” eye contact with the talent and the director. Having that eye contact with the director calms the talent instead of looking at a camera lens. This also allows the director to judge speech and body language. The EyeDirect is similar to the Mark III and it is also a cheaper alternative. This unit weighs around 30 pounds and the fitted Pelican case is a little bigger than a carry-on bag. 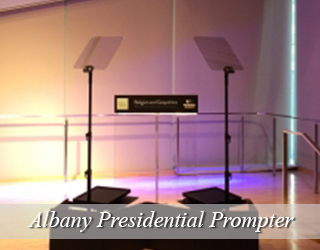 If you are in the market for a teleprompter that is perfect for podium speeches then the Presidential Teleprompter is perfect for you! The Presidential teleprompter is two-way mirror that does not obstruct the audience’s view of speaker. The text is reflected onto the glass and the speaker is able to see it clearly. We often work with the United Nations and many politicians and celebrities. To name a few Bradley Cooper, Robert DiNero, Jennifer Lopez and Michelle Obama. When you book a Presidential Teleprompter, it comes with an experienced operator who is fully trained and prepared for any stresses of a live event. 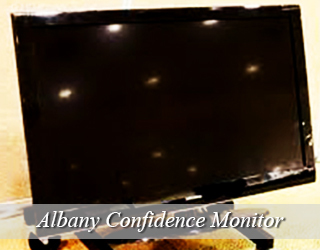 The Confidence Monitor is the best teleprompter if the speaker wants to be able to move freely around the stage. This is made possible due to the multiple “flat screen” monitors placed around the venue that are able to pick up signals from a teleprompter. The amount of monitors depend on the size of the venue and how many you need. 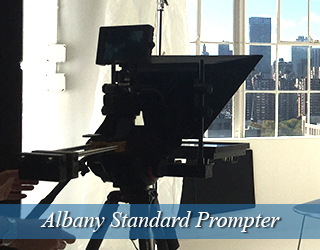 If you need a teleprompter but have a tight budget, small production or small script, the EyePrompter is perfect! 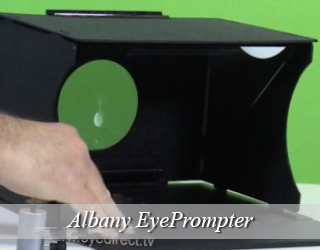 The EyePrompter is a iPad Teleprompter that requires minimal assembly and it sits on a low c-stand or small light stands. Although it does not come with a stand, it does come with an adaptor that is compatible with other cameras. Take note that although the software for the iPad Teleprompter can be controlled with an iPhone, it is difficult/impossible to adjust the speed for the talent. If you want a teleprompter that is completely invisible to the audience, then the Podium Prompter is perfect. 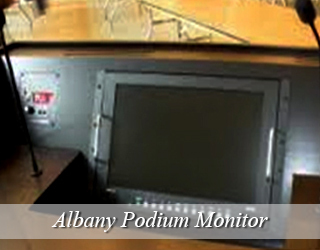 The Podium Prompter is a thin screen that is situated on the podium and it will give the audience the illusion that the speaker is looking down at their notes. Albany, the capital of New York, is the oldest populated American settlement from the 13 colonies, settled just 7 years after Jamestown, which is now a state park. It is now a city filled with museums, art, and culture. Due to its proximity between many major cities, its architectural diversity that allows it to mimic cities around the country, and The Albany Film Commission, Albany is the location of choice for many filmmakers and studios. 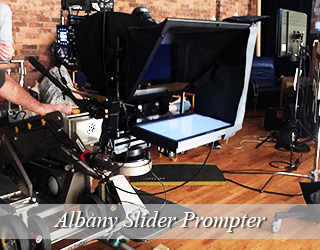 Some of those include Salt, The Other Guys, and HBO and Columbia Pictures have both used Albany as their setting of choice. 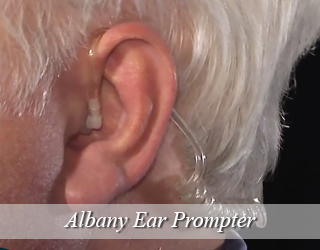 Greg is the go-to speech coach in Albany. 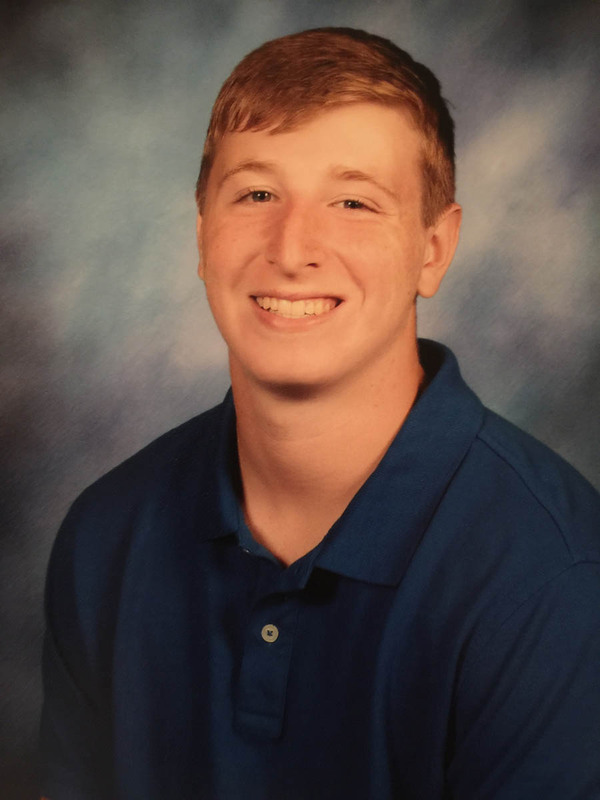 He received a degree in political sciences and theatre at Binghamton University. After college, he went on to act in several plays throughout the nation, before moving to Albany. In 2011, Greg joined American Movie Company as a speech coach, helping speakers and talent feel more comfortable when both addressing an audience and reading from a prompter. Andrea Porcelli graduated from the School of Visual Arts with a degree in film in 2008. During her senior year, Andrea worked with American Movie Company as an intern, helping out on green screen studio shoots and with marketing in the office. After graduation, she joined the company full time as a production manager and a teleprompter operator. In 2012, Andrea got married and moved upstate, where she became the producer and manager of the Albany branch. Andrea often coordinates with the NYC staff to schedule shoots and work on client requests. She is also the proud owner of the office dog, Muffy. Muffy is 7 years old and loves to be pampered. She can often be found lounging around the office and rolling around in soft blankets. Peter Wessley started his career in film in the late 90s, after briefly working at a marketing agency. He began as a production assistant on shoots located throughout NYC. He soon found himself frequently becoming the “cue card guy”, so he decided to take his marketing tactics and run with it. He was on cue for 10 years. The next logical step? Upon meeting American Movie Company’s owner the two became good friends. 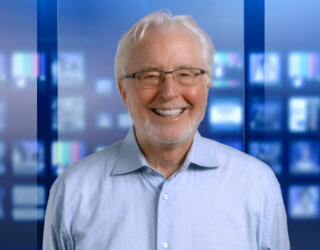 Peter taught himself and accepted help from those already in the teleprompter business. 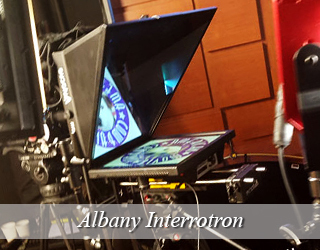 He is now our Albany based operator and works on local productions. At the moment, I am interning at the American Movie Company as a production assistant. It’s a really cool job. I’m also learning how to operate different cameras and their teleprompters. I’d never heard of this contraption but enjoyed learning how it works. It’s a dope job and I hope to be here for a while. The people I work with are awesome and don’t treat me like a kid. A lot of people don’t realize that Albany is actually the capital of New York State. There is a ton of stuff to do in this town. I’m in my early twenties and as a young person, I can tell you that I am never bored. My mom works at The Albany Institute of History and Art. It’s pretty amazing. My younger sister, Melanie, wants to work here when she gets older. Hope she gets over her shyness. She plays the recorder, which is similar to clarinet but not as cool I guess, even though clarinets aren’t cool. My mom plays the saxophone which is cool at any age. I play in a grunge band and even though I know we aren’t very good, the Hungry Hippos are always up for a good jam and some musical collaboration. I seem to go on and on. Basically, I am very happy both with work and the people I’ve met. I do have dreams and one of them is to go to New York City. Maybe this summer I’ll make it to the Big Apple. The friends I made here have connections! American Movie Company, here I come! The Albany Capital Center can accommodate up to 5,000 visitors. It consists of 22,500 sq. ft. ballroom/exhibit space, 6 meeting rooms, a 13,500 sq. ft. of pre-event space. It also connects directly to the Empire State Plaza Convention Center, The Egg Performing Arts Center and the Times Union Center arena. Rain or Shine in Albany?